The share-ride taxi is operated on a trial basis for the passengers between Ibaraki airport and the areas where don’t have regular airport bus. Shared-Ride Taxi Fares will Change on June 1, 2016. Please make a reservation through a taxi company by phone in advance. Please make a reservation by phone by the previous day 17:00. Please make sure which taxi company is in your area because taxi companies differ by operating areas. Please give the following information to your taxi company. If your baggage is of some size, notice on its number and size should be given in advance. The number of passenger (adult, child), your emergency phone number(cellphone) that your taxi company can contact you on that day. The share-ride taxi picks up passengers in order, then goes to the destination. The share-ride taxi picks up passengers in order at Ibaraki airport or the place passengers requested. The share-ride taxi sends passengers to the requested place. Please pay when you get off. Please make a reservation by phone (Japanese only). 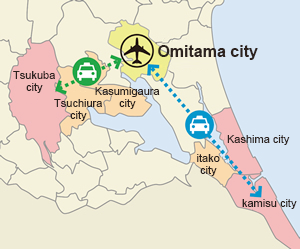 Ibaraki to Tsukuba city, Tauchiura city, Kasumigaura city, Kamisu city, Kashima city and Itako city. This share-ride taxi can only be used on the day passengers arrive at and depart from Ibaraki airport. A taxi will be shared with other passengers. If you carry your baggage like suitcases, notice should be given when making a reservation. When a piece of your baggage exceeds the dimension 56 cm×36 cm×23 cm, it is considered to occupy a passenger seat and the number of passengers to get in the car will be reduced. Passengers with large sized baggage must notify us when making a reservation. This share-ride taxi is operated following the arrival of the flight. Please note that this is because this taxi is shared with other passengers so your loading time may take longer. When the flight is delayed or cancelled, we may notify passengers via their emergency contact phone number. No stopovers are allowed from Ibaraki airport to your destination. In case of changing or cancelling reservations, passengers must notify the taxi company directly. If the tax is fully booked we reserve the right to cancel your reservation. Disabled customers, who have difficulty getting in and out of a taxi, require a helper. With regard to children under age 6, who are to be accompanied by passengers excluding those under age 6, a child under age 6 is for free per passenger. Infants under age 1 are always for free. Each child from age 1 to under 6 is considered to need a seat and counted as a passenger, while an infant under age 1 isn’t counted as a passenger. In case of emergency, i.e. traffic accident, your destination may be changed. Since this share-ride taxi is a trial operation at the moment, everything is subject to change.